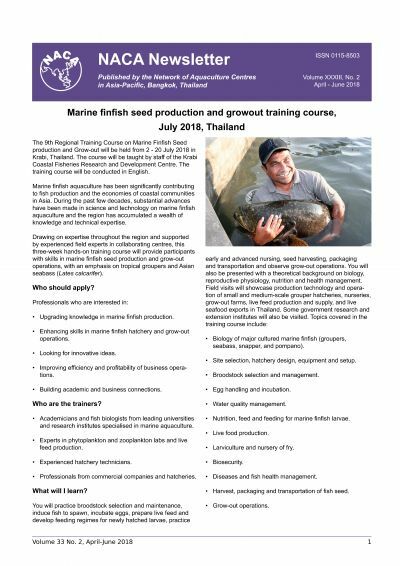 Marine finfish seed production and growout training course, July 2018, Thailand. Global fish passage forum to include first symposium on hydropower and fish. International Workshop on Rehabilitation, Propagation and Conservation of Mahseer, April, India. World Brackishwater Aquaculture Conference, 23-25 January 2019, Chennai, India. Offshore Mariculture Asia 2018, 15-17 May, Singapore. Video lectures: Regional Training Course on Culture-based Fisheries in Inland Waters. Youth and Fish Drawing Competition Art Book. 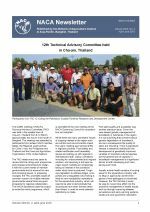 Report of the Sixteenth Meeting of the Asia Regional Advisory Group on Aquatic Animal Health. FAO-NACA expert workshop on newly emerging aquaculture practices.